The plethora of minimalist trail running shoes coming on to the market are a sure indication that the trend is here to stay for now. With that in mind it is timely that we bring you a review of two shoes who in my opinion span both ends of the minimalist movement. One is from established brand New Balance that has catered to runners of all shapes and sizes and disciplines over the last few decades. The other is from Vivobarefoot, a relative new kid on the block who only make minimal shoes. How do they stack up ? Well let us look at the offering from New Balance first. The first thing I noticed about these shoes after the striking colours of course was the length of the laces! Now I wear a pretty large size (US12) and the last thing I usually think about with shoes are the laces, but boy they were so long. I was aiming to wear these shoes as Anton wanted them, with no socks. So this made the fit even more snug and the excess lace that bit longer. Well in order to get out the door and not lasoo the neighbours cat with every stride I did what Anton did when creating this shoe and took the knife to them removing about 30cms off lace. Mission accomplished and I was off. Immediately this shoe felt fast, low to the ground and surprisingly a snug fit. The natural roll of my foot made them just feel like I was running on the trail barefoot. Even though they have a small heal to toe drop of 4mm,when compared to other shoes in this range these seemed more “foot like” if you know what I mean. This is the Version 2 of the incredibly popular V1 which went mainstream. Gyms, walkers and trail runners all over the world got on board with this shoe when it was initially launched and today is still seen as a real pioneer of the barefoot movement. So what have NB done to improve on an already quality shoe ? Well to begin with they have removed the single band of support running across the top of the forefoot section. There is now very little structure making for a more relaxed and comfortable fit. For some with a narrow width foot may find that there is a little too much movement available but with some proper attention paid to the way you lace it up you should be ok.
Secondly, they have added some additional padding around the achilles area which makes the fit of the shoe more snug without compromising that barely there feel. And finally, and probably the biggest change is they have reworked the famous Vibram sole to enhance the tread and increase the grip. They have done this in two ways, firstly by raising the tread profile and secondly by creating a number of smaller cells of grip in areas where the foot would naturally want it to grip eg around the ball of the foot and the heal area. On a mixture of hard packed trail, mud, roots and rocks with a little water thrown in these shoes performed exactly as you would expect from a tried and tested formula. Fast, comfortable, very grippy on everything except slick rock and sandstone rocks and they draines really quickly. Not once did I consider wearing them with socks and even though some material did make it into the shoes through the toe box, it was soon washed clear at the next river crossing. This shoe based its design on being a wrap around of your foot and so it comes with no removable inserts, so what you see is what you get and this is reflected in the feel. Would they stack up for a big ultra ? I am not the sort of runner to have the ability of Anton to run efficiently over the ground for 15 hrs and barely leave a footprint. I would suffer from too much stone bruising to be completely reliant on a barefoot shoe for clomping around an ultra course. So for me, they have become my favourite shoe when on a recovery run around my local trails, or a “barefoot” track session on the grass ovals and a handsfree, no nonsense 10k or 20k trail race where I can just go for it. Would or could I run further in them ? Probably, but for now, I will rely on more cushioned shoes for my big 6-8hr training runs. In conclusion, this shoe would be ideal for a whole bunch of uses, for those transitioning to more barefoot style of running, those neutral runners who want to hit the trails, a great recovery shoe for speed sessions on the grass and also for wering to the gym. It is one very versatile shoe coming in a range of cool colours from a brand that has only sought out improvements where they are needed. The best bits they have left alone by staying true to the original intent of the shoe. I liken this approach to the way Porsche have improved but not messed with the design of the 911 over the years. 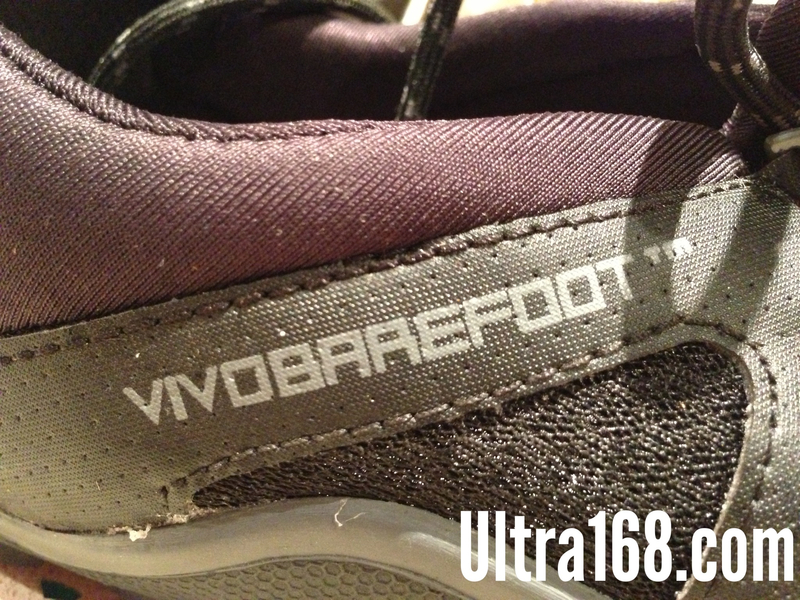 It was fortuitous timing to be able to test two barefoot shoes back to back as when I was making my weekly visit to visit our sponsors at Footpoint Shoe Clinic in Sydney they had just received a pair of Vivobarefoot Breatho Trail shoes in that day. They were in my size and before long I was out the door with my mind focussed on a shoe v shoe review. The unboxing of shoes from Vivobarefoot are always fun as they put a little extra care and attention into the recycled packaging. Each of my shoes had their own little sock bag and the usual blurb of making sure the transition from normal running to more minimalist running was taken seriously. Vivobarefoot are a company known for being created from the ground up as a dedicated follower of the minimalist movement. The Breatho Trail is one of two options in their off-road creations that continues this trend. It has been around for about a year now and whilst it hasn’t set the world on fire by being worn by the likes of Anton Krupicka’s competitors, there are enough examples of runners falling in love with this shoe to keep it on your list of considerations when making the move over to barefoot running. I said they have two options in this space? Yes, they also offer the Neo. The main difference between the two is that the Breatho Trail is the lighter of the two and has a removable insert. 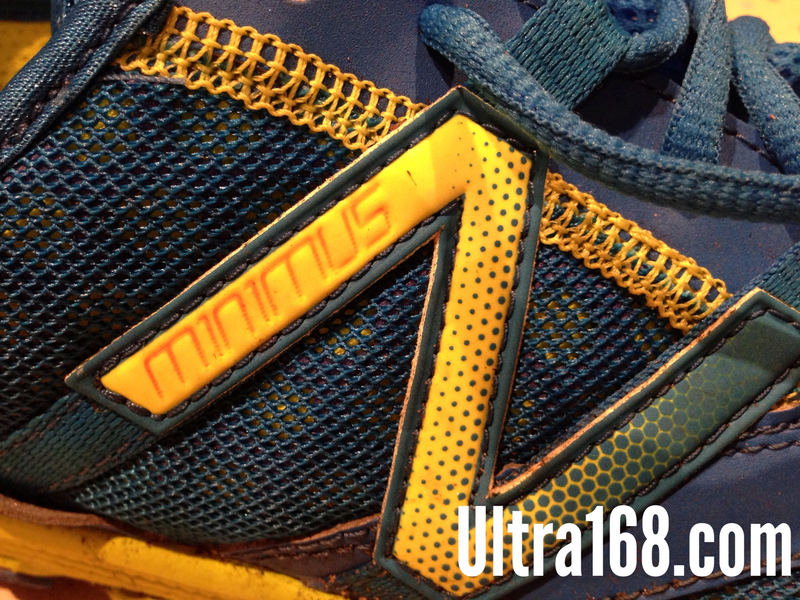 Its more of a competitor to the Minimus than the Neo it. You could almost liken the Neo v Breatho as Winter and Summer versions of the same thing ? 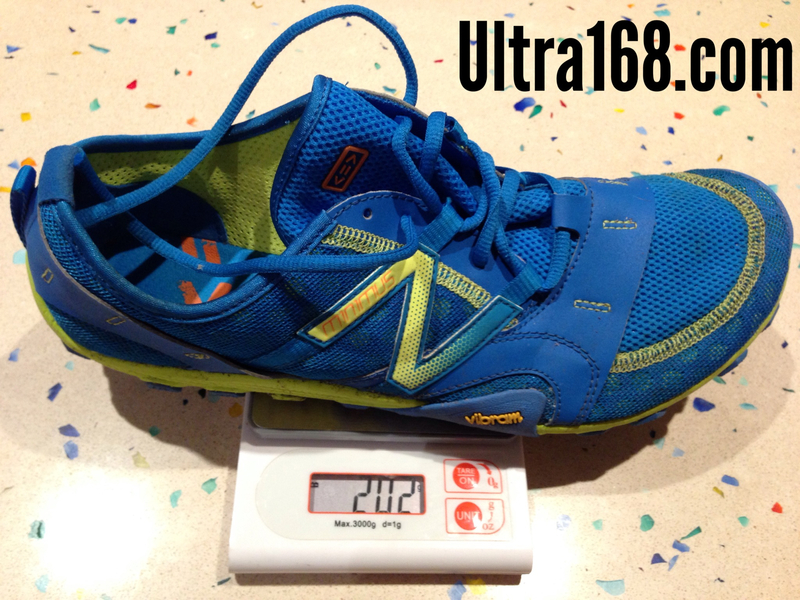 It must be pointed out that even though they are the lightest version of trail shoe they make, they did have a feeling of being a little more solid in their build when compared to the NB Minimus. 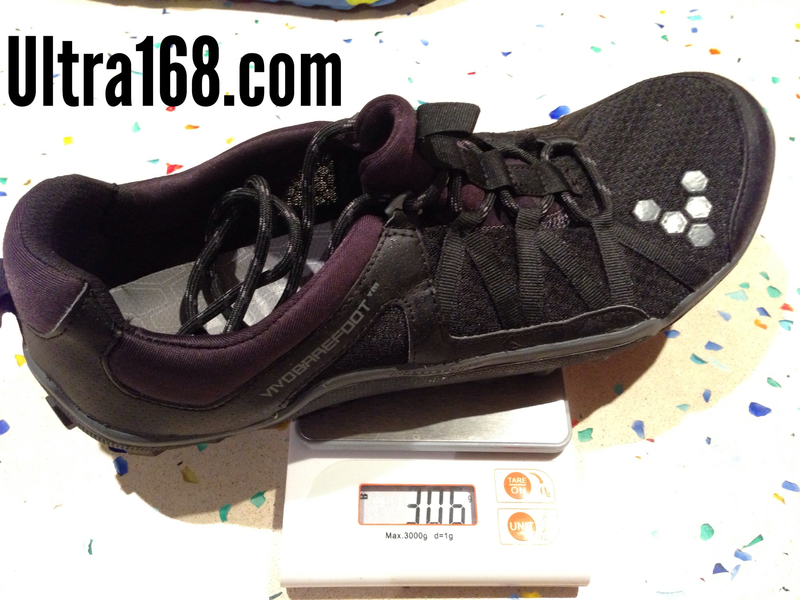 This was later confirmed on the scales where they were a shade over 300 grams for US 12 or approximately 100 grams heavier than the NB Minimus. Where does this extra bulk come from ? Mainly in the materials being used and the construction feels that bit more durable but also in the tread, which is deep and thick in comparison to other lightweight minimal shoes. This more durable build quality was seen on the wear of the shoe over the months I have been using them. The upper still looks the same today as when they were first unboxed. The upper has a mesh like structure but whist not too dissimilar to the NB’s efforts, they seem to have a little more thickness in materials and a little less easy when draining. Initially they almost felt constraining as the achilles area is very well padded, but this feeling soon loosened up after the first run. The Breatho’s also came with the obligatory yardage of laces and again the knife came out to reduce them by about 15 cms. Running on similar trails to the NB’s I noticed a marked difference in the grip available, especially when pushing off on the grassy hills. Where the NB Minimus was more grounded and the feel was very evident under my forefoot and toes, the Breatho seemed to be a little more rigid and aggressive in its feel. Almost like the shoe wanted to tear up the turf when you accelerated. I removed the insert to see if this offered more feel and while it initially made the shoe more snug it still had this same feel. I had to get to the bottom of this as it was a confusing feeling for a shoe designed to me so minimal in its approach. And then it dawned on me – it was the sole itself. The tread is so aggressive and on closer inspection, it is so much deeper than anything I have seen this side of Salomon’s new Fellraiser or Fellcross shoes! This aggressive tread wraps itself all round the shoes including a long way up and around the heal area. So in order to see if this trade off in feel was countered by superior traction, I went in search of some very muddy trail. Luck would have it that my local trail around Manly Dam had received a months rain in a matter of days and this provided the ideal test conditions. To get there from the car required a couple of kms of road and fire trail and boy these shoe were noisy on the road. Definitely not a shoe to run to the trail on. They felt just too clunky for that. Once in the mud, they stuck like my Inov8 Talon 190’s and yet seemed to be more stable like a normal shoe. They certainly felt fast but the numbness of the feel due to the tread was just lacking for me. So sticking with the car theme, this shoe got me thinking ? It reminded me of the Landrover Defender – along with the original Jeep was a pioneer of off road transportation. Yet while they never fail in the mud, they are little more clunky to drive on the road. 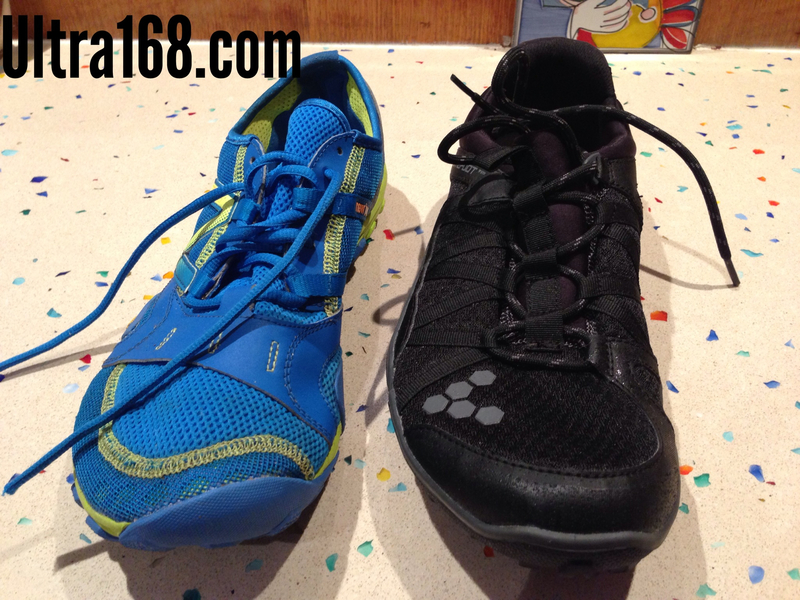 DISCLOSURE: Both shoes were provided to Utra168 for testing by Footpoint Shoe Clinic and we are grateful of their continuing support and investment into growing the local trail running community. Great review – thanks – haven’t run in New Balance shoes for a long while but certainly tempted by the Minimus 10V2 Trail. How do they compare size-wise to other shoes? I generally take a UK 10 in Nike, UK 10 in Adidas and UK 9.5 or 10 in Inov8.